Previously I have written about the 8" Fostex FE206En fullrange drivers and two pairs of Fostex FE206En double bass-reflex speakers with front firing ports. For their size and cost the Fostex FE206En double bass-reflex speakers really sound great. The speaker enclosure plans for the double bass-reflex cabinets were provided with the FE206En driver documentation which also included speaker cabinet plans for a large back-loaded horn speaker enclosure. Being impressed with the great sound from the smaller double bass-reflex speaker boxes I decided I wanted to get horny and have a pair of the large back-loaded horn loudspeaker enclosures made up. The back-loaded or rear-loaded horn loudspeaker system is like bass-reflex and double bass-reflex speaker types in that the sound radiated from the back of speaker transducer is utilized to enhance the bass response. The difference however is that back-loaded horn (BLH) speaker enclosures make among the most efficient use of the back wave from the speaker driver. The back-loaded horn speaker enclosure operates by developing the bass response using the back wave from the speaker driver and an expanding horn section. The remainder of sound spectrum (mid and high-frequency ranges) is radiated directly from the front wave produced by the speaker driver. Back-loaded horn speaker enclosures are generally amongst the most efficient enclosure systems and respond well to the subtlest components of music signals. 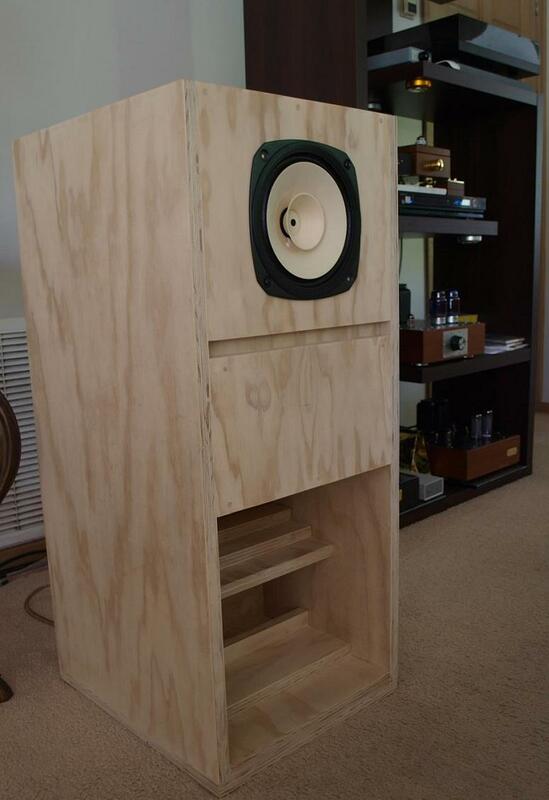 For "tighter" sound reproduction, you can reduce the interior volume of the horn speaker cabinet using fill material. Sound absorbing material should be used directly behind the driver and also at the mouth of the horn to smooth out the frequency response. The back-loaded horn speaker enclosure plan is from the FE206En datasheet that was included with the Fostex FE206En driver. Figure 1 below shows the speaker box plan from the datasheet. 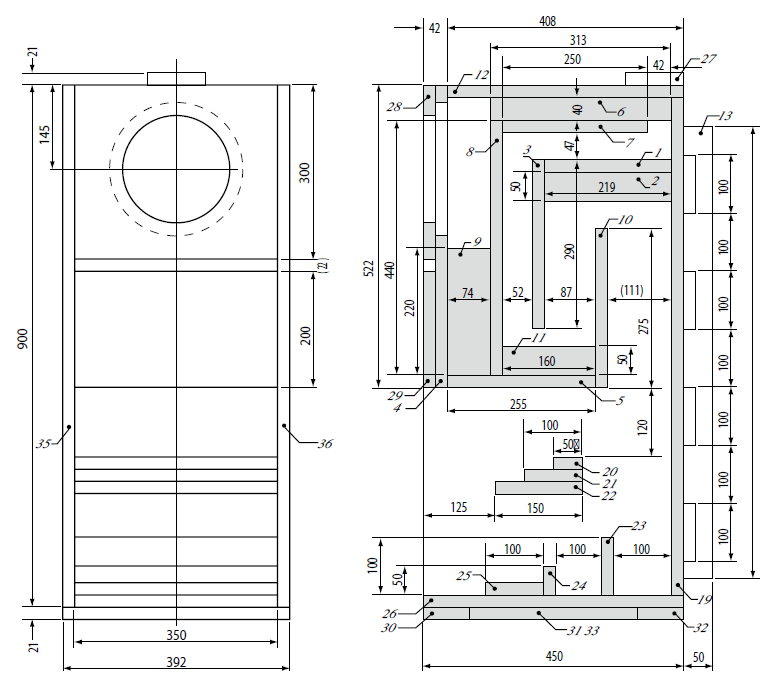 For the full dimensions of the Back-Loaded Horn speaker enclosure plan and the cutting plan see the Fostex FE206En datasheet - (PDF 488kB). 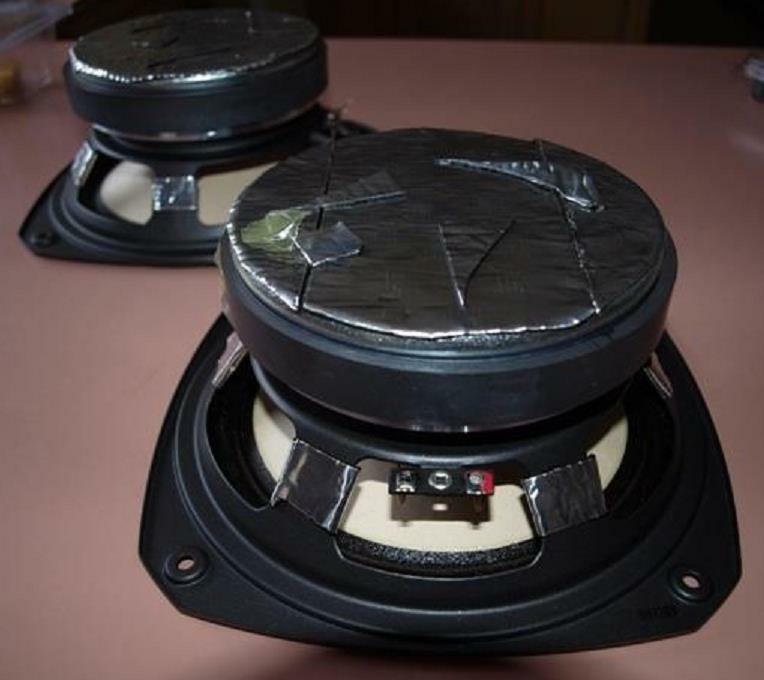 The photographs below show the Fostex FE206En fullrange speaker drivers used with the rear-loaded horn speaker cabinets. 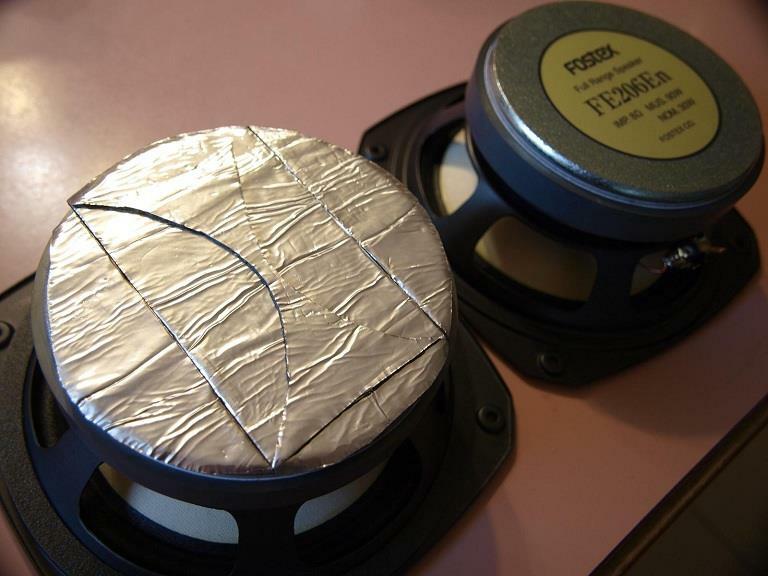 The magnet of the FE206En driver is extremely large so it is also covered with bitumanized aluminium foil tape (Photograph 2) to help reduce sound reflections from the back of the speaker box. Better yet would be to cover the magnet with a more sound absorbing material like felt or wool. Note that there are many tweaks and modifications that can be made to improve the performance from the Fostex FE206En drivers. For more tips and ideas see the Fostex FE206En fullrange speaker driver tweaks and modifications page. To the stamped speaker chassis I have added bituminous aluminium foil to dampen the Fostex FE206En drivers frame (Photograph 3). The back of the drivers really has to be treated in some fashion due to the large size of the magnet surface and the shallowness of the first (compression) chamber in the horn cabinet. Bituminised aluminium foil is layered on the magnet and and also wrapped around the spokes (struts) of the speaker basket. Felt is layered on top of this. A few months after requested, my speaker cabinet maker delivered the first of the two large back-loaded horn speaker cabinets. 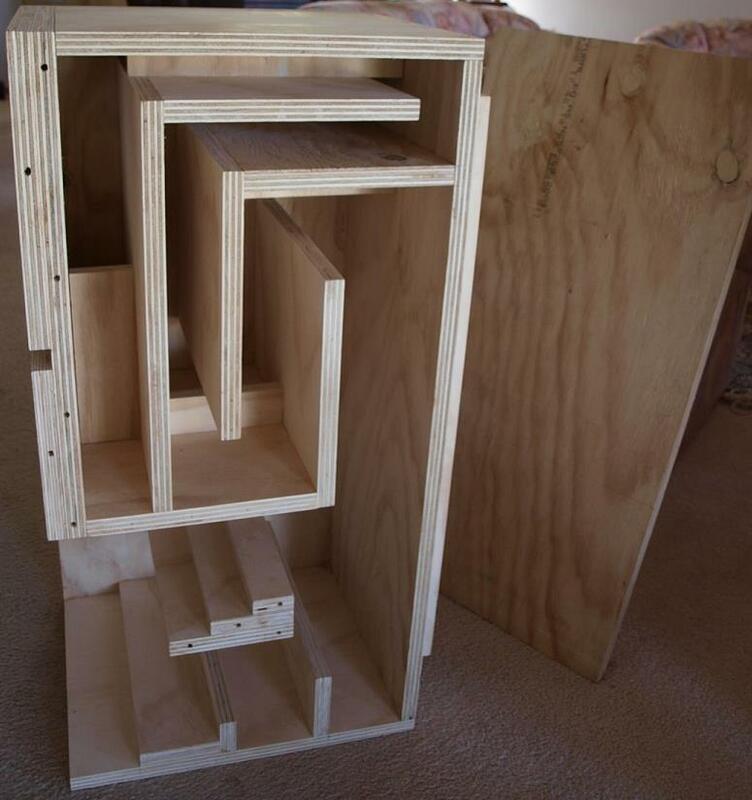 In Photograph 4 you can see the complexity of design and construction of the horn speaker cabinets. There are thirty-six pieces of timber in each speaker box. Stainless screws, glue, dowelling and clamps were employed to assemble the horn speaker boxes. The timber used for the speaker cabinets is 21 mm thick pine plywood. The front baffle board and bottom are doubled up in thickness. 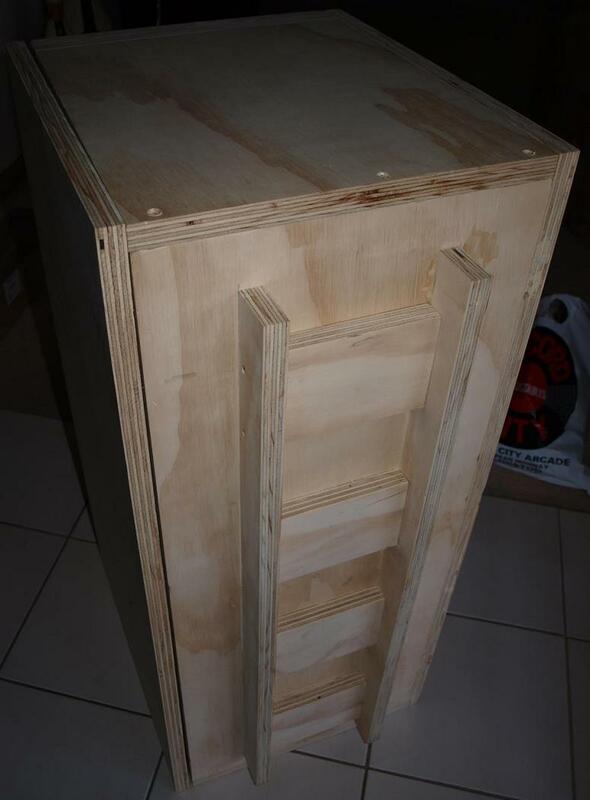 There is a large spine on the back of the horn speaker cabinets which makes them a very rigid structure. 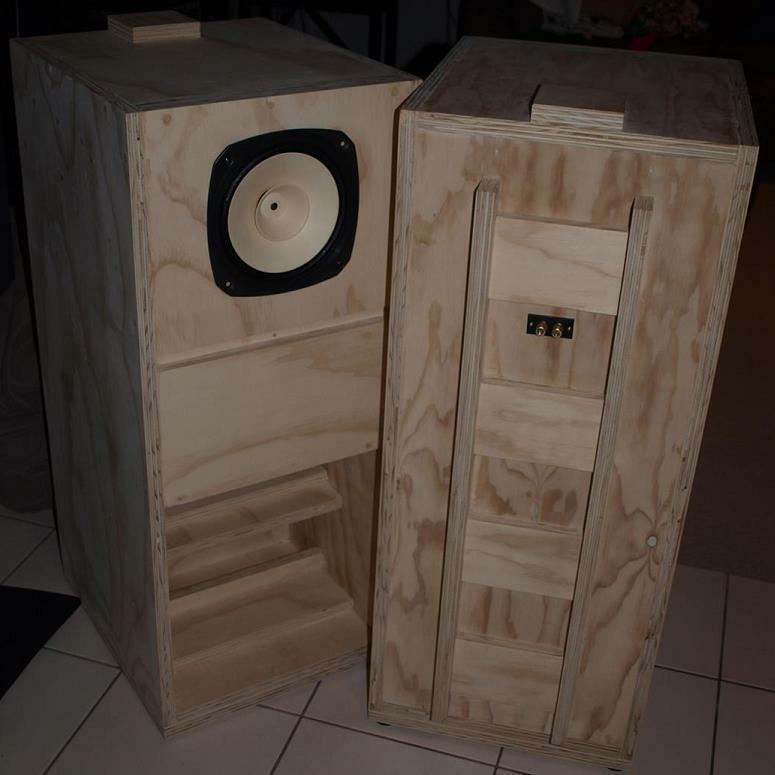 The plywood horn speaker boxes are largely resonance free (Photograph 5). If you are a big fan of pine, these plywood monsters will be visually pleasing to you. The speaker boxes arrived fully sanded so all I had to do was seal the surface of the timber. To do this I applied two coats of Australian beeswax to the outside of the horn loudspeaker cabinet. To the mouth of the horn I applied a heavy cedar oil. Both brought the pine grain forward and made the boxes look quite attractive and smell delicious! (Photograph 8) The horn speakers are quite heavy so carpet sliding feet were fitted to the bottom of the speaker cabinets so they can be easily moved around. Once the two enclosures had been delivered I set about running the wiring from front to back to pick-up the binding posts. Gold plated binding posts are used to connect the speakers at the back. 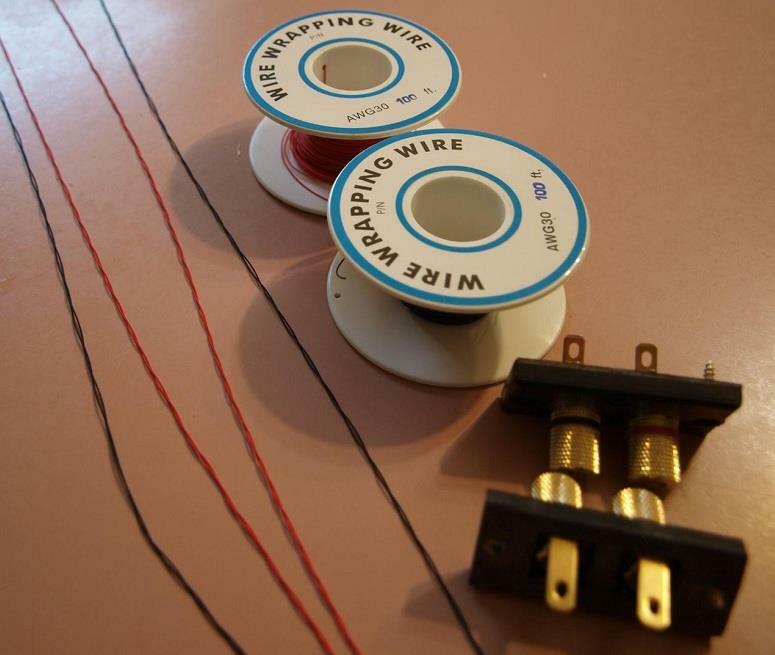 For connection to the sensitive FE206En fullrange driver use two strands of wire wrap wire (30 AWG, silver plated copper wire, PTFE insulation). Remove any excess slack from the connecting wire and the FE206En drivers are securely fastened to the horn speaker boxes using the supplied gasket. The FE206En datasheet makes recommendations for fill and sound absorbent material as shown in Figure 2. I only added dampening material to the compression chamber immediately behind the driver. Originally I packed the compression chamber with Dacron poly fill. Later I realized I had stifled the bass a little. The mids though were stunning. I finally settled on a single layer of Dacron directly behind the driver and a small amount at the bottom of the first chamber. The Fostex FE206En is a "fullrange" driver type and their main appeal is use in a single-driver loudspeaker system where no crossover or correction network is required. The advantage here is that there will be no crossover distortion or suppression of the dynamics which tends to occur with almost all passive crossover circuits. 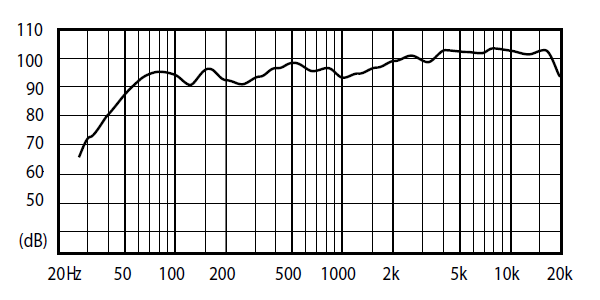 Now the Fostex FE206En datasheet includes a frequency response plot of the back-loaded horn speaker system, shown below in Figure 3. You will notice that above a response of about 2 kHz you begin to get "mid-range shout" from the single 200 mm driver. This will often make the speakers sound bright and perhaps lean on the bass end. One way to try and compensate for this natural rising response of the FE206En is to position the speakers off-axis (ie. toe-in the speakers). 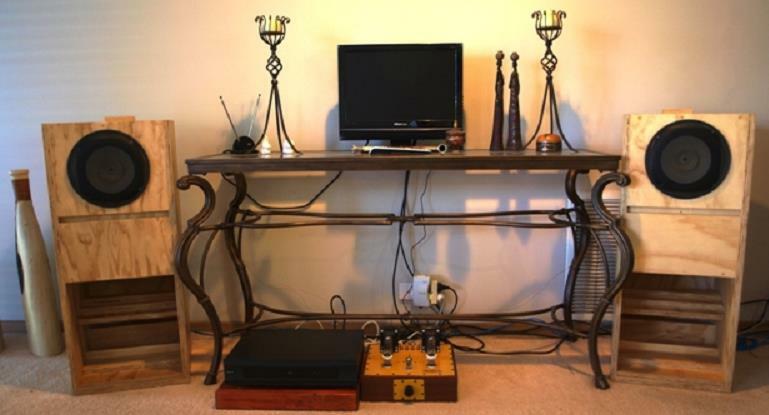 The amount of speaker toe-in required will vary dependent upon the listening room geometry, amplifier and personal preference. Begin experimenting with a speaker toe-in of about 30-degrees and adjust from there to your liking. With the horn speakers can also try use the room boundaries to extend the mouth of the horn by pulling the speakers into wall corners. You will want to take time experimenting to find the best speaker placement as proper placement of the horn loudspeakers will be rewarded with excellent acoustics with pin point accuracy. If you can't get a balanced sound with the speaker placement and setup you should consider a baffle step correction (BSC) network. The BSC network tames the response from the mid-range (at the baffle step frequency) on up, without affecting the lower bass response. Where these drivers can sound overly forward (too hot in the mid-range) this adjusts that forwardness leaving the bass and treble better balanced. I find that the mid-range richness is why these drivers can sound good with acoustic instruments and especially vocals. Now many may find that the BSC circuit can reduce or suppress the dynamics and for that reason I don't really like to use them. Furthermore, with the BSC circuit you also lose a little of the speakers sensitivity, which could be an issue with low power amplifiers. You can use the online calculator to determine the value of choke and resistor required based on the width of the speaker baffle and impedance of the speaker. The circuit is simple, just one inductor and one resistor in parallel with each other and in series with the speaker. If you are not use to listening to single driver loudspeaker systems, the first impressions are not necessarily the best. 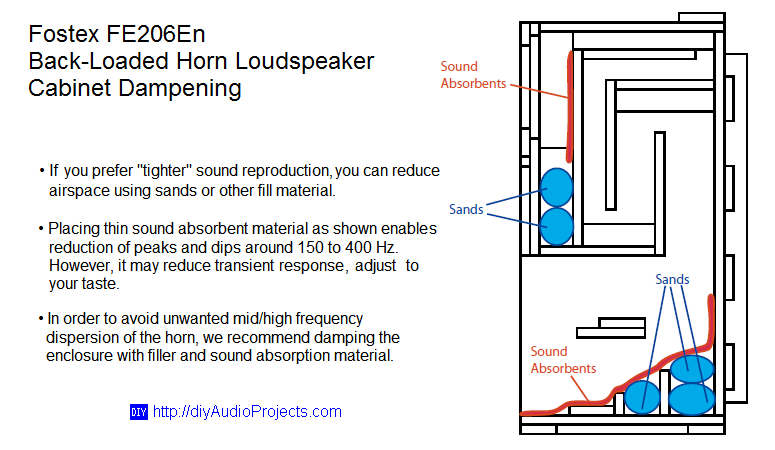 I would say that the use of low frequency augmentation is required if you really like a solid bottom end as the horn speakers begin to roll-off steeply below about 60 Hz. The bass from the horn speakers is cleanly defined and very articulate but not overly extended. The treble is good but once more not overly extended. Where this type of single driver loudspeaker system does shine is in it's ability to image. The back-loaded horn speakers can draw an extremely accurate soundstage. This is due to the fact the all the music is coming from a single point and is not smearing the sound over multiple drivers. Like elctrostatic speakers, the voices really come to life. The mid-range performance from these horn loudspeakers is excellent. Big, bold and made of pine they are. Excellent sounding they are also. For me, with my Paris amplifier (dual mono SE 6EM7 integrated with 4S preamp) in triode mode, the combination of a high sensitivty speaker, razor sharp sound stage and extended and very clean mid-range, can lead to a whole new listening experience. And this is at a total system price that many can afford. Mark Houston, DIY Convenor, Melbourne Audio Club.